‘I only like 5 things: pasta, bread, tortellini, rice cakes and Weetabix’. 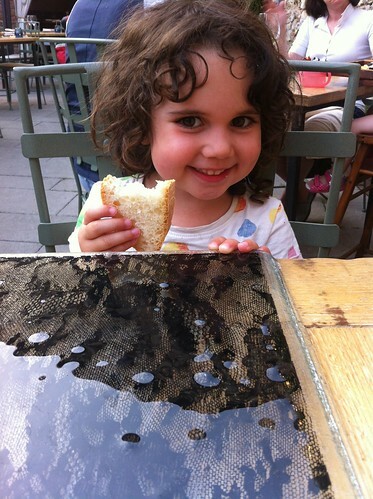 Then, she gave us one of her disarming smiles, while triumphantly holding a piece of white bread. As cute as I find her (and as proud as I am of the Italian selection in her list) dealing with a fussy eater is no joke. It’s annoying, frustrating and sometimes positively infuriating: you put in front of your children a meal that you deem delicious and nutritious, a meal you spent a good bit of time planning and putting together and they look at it as if you had offered them a plate of grilled scorpions. Can they be any more horrified? Your delicacy is their worst nightmare and there is nothing you can do to make them change their mind. You can scream, beg, negotiate, but the food stays untouched. I had my share of moments like this and before we started travelling with kids, this made a bit anxious. I can somehow deal with it at home, but how would I cope with it when dinner actually IS a plate of scorpions? How can you get children to try unusual food when travelling? I gave this problem a lot of thinking and while we have never literally offered them a plate of scorpions, we came up with some ideas that have proven helpful. In the matter of a few weeks, we have expanded our repertoire to a list a good bit longer than 5 items and we have even included some proteins: not a bad result! These are some of the ideas that worked for us. It will never be the same as you find locally, but it can work as an ice breaker. If you don’t like cooking, a local restaurant can also be a good option: we have a local Japanese restaurant that serves a nice lunch and my kids love noodles and miso soup, flavours which came in handy in several countries. My daughter is the fussier eater of the two but she loves cooking and very often she will try something if she has helped to make it and knows what exactly is in it. Abroad I find a fun way to do this is to involve them with food shopping (if you are in self-catering accommodation) or joining a cooking class – some are specifically for families and double up as a real fun way to spend the afternoon. Refusing to eat new food is not always just about being contrary. Even I find that sometimes my stomach actually demands a break from the exotic and can do with more familiar food. I imagine this is the case for kids also, so when we travel we always try to mix the new with the old. I find the best way is to go grocery shopping and cook at home: I guess there are some destinations where the familiar is really hard to come by, but I find that if stuff like pasta, noodles, potatoes and rice are accepted, you have a lot of the world covered. 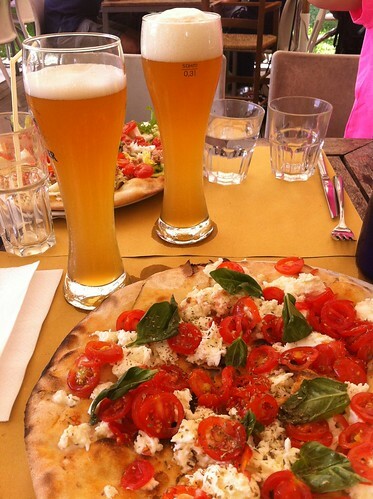 Pizza is not everywhere as nice as it is in Rome, but it is a good fallback option, especially with my pizza loving kids! Before I had children I thought that the best way to get them to eat dinner was to get them to the table hungry. If they are hungry, they will eat: won’t they? Now I know that this approach is likely to backfire when new food is involved. A hungry child will be more stubborn than normal, you will get increasingly tense during the face off and the new food will be forever blacklisted: for me, it works much better to give the children dinner when they are happy to eat but not ravenous yet: if the first morsel is accepted, even just as a game, dinner is more likely to go smoothly. A whole plate on new food can be intimidating, so we usually start with ordering food for us adults and share. Depending on the reaction, we can give up our whole plate to the kids or try something else: never underestimate how much kids love to get something not originally intended for them! How are your kids when it comes to food: adventurous or cautious? Is there a food they loved that really surprised you? I’d love to hear your experience!